Trinity Designs: Fresh Flowers Anyone? Or how about the next best thing - a card with flowers? I've been having the best time with the new Summer Mini stamp set called Fabulous Florets. It is one of those stamp sets that gives you so many different looks and once you start stamping with it, it's hard to stop! This card is one that I created last month for my May classes and the colors were perfect for me to start thinking about Summer. It made me smile just working with them. The best part is that it's one of those cards that comes together so easily. 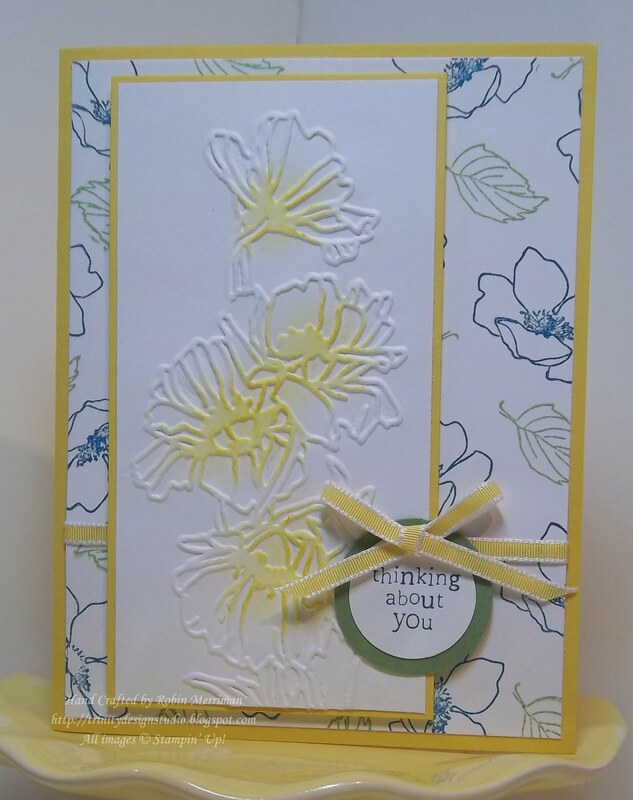 I used Whisper White cardstock over a card base of Daffodil Delight. The White cardstock was stamped randomly with two images from the stamp set in Pacific Point and Wild Wasabi ink. I wrapped a piece of 1/8" Daffodil Delight ribbon around that layer and adhered it to the card base. 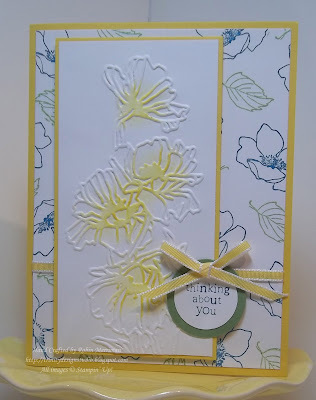 The focal layer was a piece of Whisper White cardstock layered again on Daffodil Delight. I ran the White layer through my Big Shot with the Flower Garden Embossing Folder, then added Daffodil Delight ink to the flower centers to make them stand out. The greeting comes from the stamp set A Touch of Kindness, also from the Summer Mini. It's stamped in Pacific Point on a white scrap, punched out with the 1" Circle Punch and layered on a piece of Wild Wasabi punched out with the 1 1/4" Circle Punch. 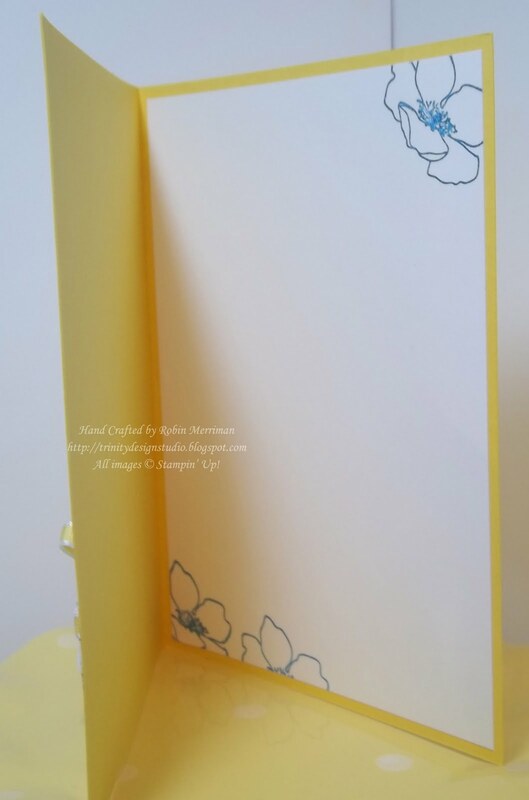 A little bow made with more Daffodil Delight ribbon finishes off the card. It's attached with a Mini Glue Dot. Lots of Stampin' Dimensionals on this card, four under the focal image, one under the greeting circles. Stamped simply with one flower and Pacific Point ink leaving lots of room for your message. This card just makes me happy! It's bright and warm at the same time and I love how those colors just work so well together. Hope you like it too! This is SO pretty. I was curious as to which DSP you had used and was surprised to see you made it yourself! Great job on the colors and design of this card! Beautiful card Robin! Love the colors!! Oh oh oh, I love this card! Just love your colors! Can you believe I have NO yellow paper here in Taiwan? I was planning to rememdy that, and after seeing your card I think it will have to be soon.